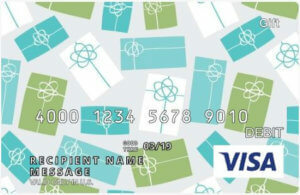 Bonus rewards and deals on new gift cards from top retail brands. Use gift cards to save money on the things you’re already planning to buy. It’s hard to believe we are nearing the end of the year. The deeper we get into the holiday season, however, the fewer the gift card deals we will find. That’s because retailers know you will turn to gift cards at the last-minute. So shop now, shop early and save money on gift cards! And don’t forget to stack and save with gift cards on all of your personal shopping as well. Staples IN STORES ONLY. 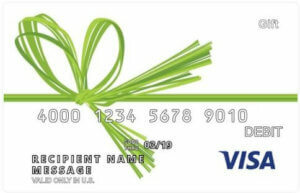 Save $5 on the purchase fee when you buy a $200 Visa Gift Card. While supplies last! Get 5% savings when you buy top store and restaurant gift cards with your REDcard. (Some restrictions apply. Check store for details. 12 Days of eGift Card Deals! – Now thru December 23, a New eGift Card Deal will be announced each day. Check back every day for new deals on top retailers. 12 Days of Gift Card Deals! – Now thru December 17, 12 Days of eGift Card Deals. 2 New eGift Card Deals announced each day. Check back every day for new deals on top retailers. Happy Promotion via Just For U: Gift Cards on sale. Buy Happy Guy of $150 or more and get $15 off. Buy Happy Lady of $75 or more get $7.50 off. Buy Happy Dining of $75 or more get $7.50 off. Buy Choice Dining of $75 or more and get $7.50 off. Buy Happy Teen of $75 or more and get $7.50 off. Buy Happy Her, Happy Beauty, Happy Bride, Happy Kids, Happy Eats, and Happy Bites of $50 or more get $7.50 off. Find these and other gift card deals at Albertsons. Gift Card Mall – Thru 10/18 (While Supplies Last) Save 20% on Happy Cards (online only). Get 20% MORE with the purchase of a $50 Happy Card Gift Card. Save Instantly. No promo code needed. Simon Malls – IN SIMON MALLS ONLY. (Not valid at Simon Outlets or Mills.) Purchase at least $50 in Aeropostale, Childrens Place, Domino’s, Gap Brands, Regal Entertainment Group and Ruby Tuesday Gift Cards, and Get a $10 Simon Visa. Simon Malls – IN SIMON MALLS ONLY. (Not valid at Simon Outlets or Mills.) Buy The Cheesecake Factory® Gift Cards worth $100 or more at Simon Guest Services September 17–30, and get a bonus $10 added to the total value of your purchase. ONLINE ONLY. Make Your Own Sale with big savings on Happy Cards! Save 15% on Happy Kid Gift Cards when you buy a minimum purchase of $50. Save 10% on Happy Teen Gift Cards when you buy a minimum purchase of $50. Save 10% on Happy Lady Gift Cards when you buy a minimum purchase of $50. 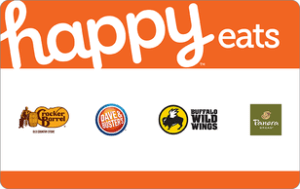 Save 10% on Happy Eats Gift Cards when you buy a minimum purchase of $50. Earn 4X Fuel Rewards at Safeway. 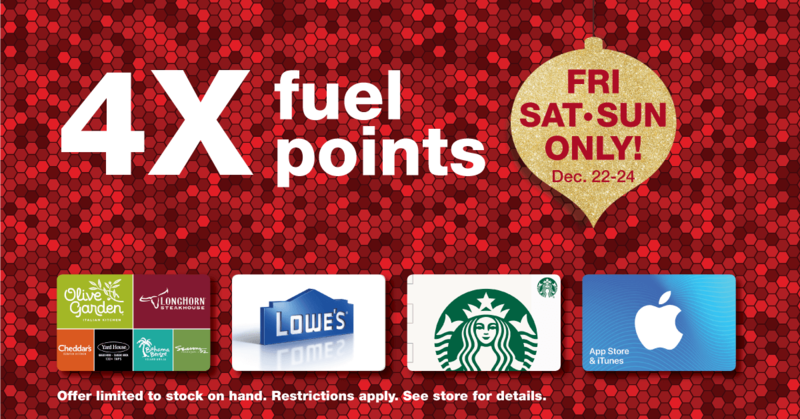 Safeway customers will receive 4x Fuel points when they purchase any Happy Card Gift Card. Coupon must downloaded between 8/22 and 9/1. Once downloaded, coupon must be redeemed by 9/8. Mastercard Gift Card Promotion at Staples.com – Buy a $100 Mastercard gift card and the $6.95 FEE IS WAIVED! While supplies last! ONLINE ONLY. 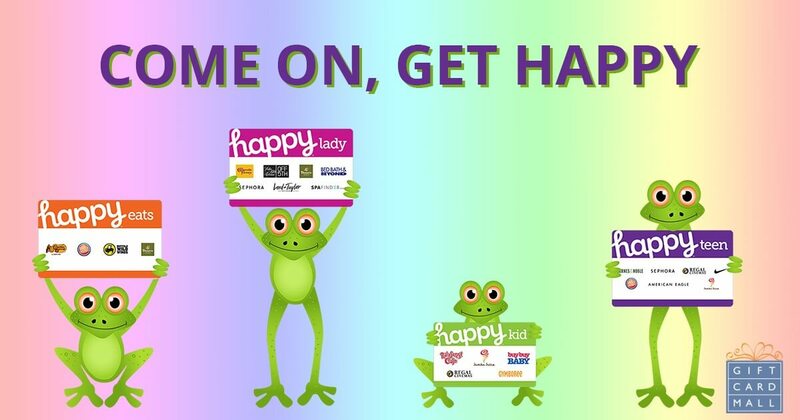 Save 5% on Happy Kid Gift Cards when you buy a minimum purchase of $20 worth of Happy Kid Gift Cards. 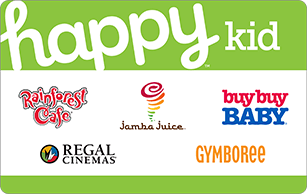 That means you can save 5% on all the brands listed on the Happy Kid Gift Card including: Rainforest Cafe, Jamba Juice, Regal Cinemas, Buy Buy Baby and Gymboree. Old Navy eGift Card Back to School Promotion – Get an Office Depot / OfficeMax coupon by email when you buy an Old Navy eGift Card 8/13/2018-8/20/2018. Not valid when purchasing physical Gift Cards at oldnavy.com. Limit one coupon per customer. Office Depot OfficeMax coupon: Valid for $10 off qualifying $50 purchase (before tax) of regular priced items. Excludes technology. Other exclusions apply. See coupon for terms and conditions. ONLINE ONLY. Find instant savings, value-add and other gift card offers on top brand gift cards for Back to School! 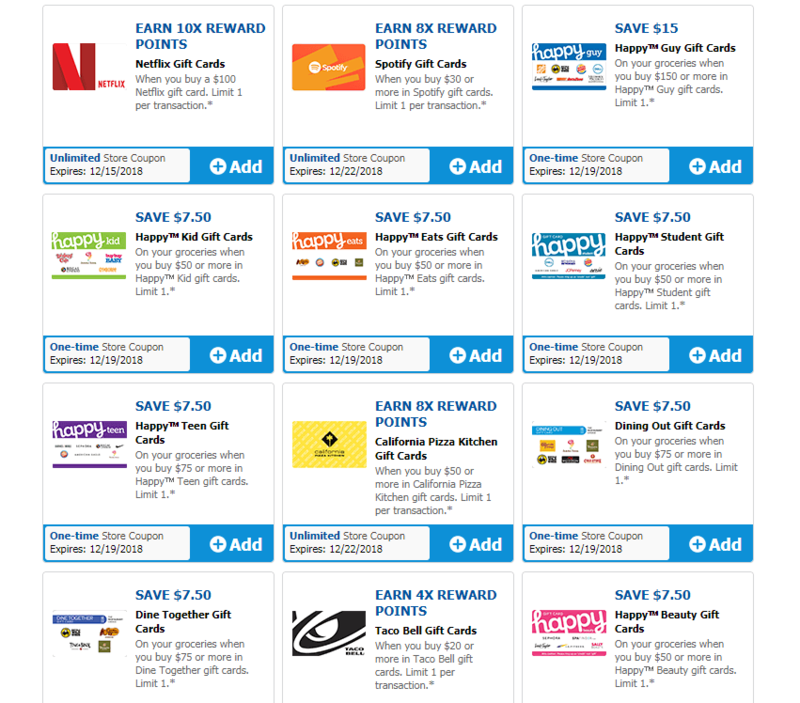 Top brand gift cards on sale for “Back to College” include: BJ’s Restaurant, Brown Shoe Services, Domino’s Pizza, GameStop, GAP, HelloFresh.com, JCPenney, Jiffy Lube, Overstock.com, Sephora and Southwest Airlines. ONLINE ONLY. Buy a $40 or more Children’s Place egift card from the Children’s Place website and receive a $10 gift coupon to be used on a next purchase of $40 or more. See website for details. Staples Gift Card Promotions – Save $10 on a $100 Lowe’s egift card, while supplies last. See store for details. Staples Gift Card Promotions – Save $5 on a $50 Panera egift card, while supplies last. See store for details. 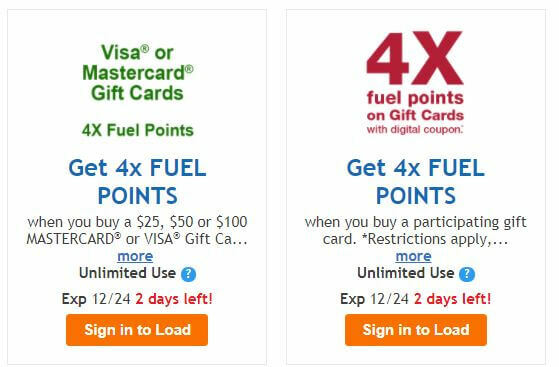 Kroger Gift Card Promotions – Earn 4X Fuel Points on gift card purchases from June 6, 2018 to June 19, 2018. See store for details. Gift Card Mall – 6/11 to 6/17 (While Supplies Last) Got a home improvement project coming up? Or does dad love a good Lowe’s gift card? Then check out the saving you can get from Gift Card Mall (online only). Buy a $200 Lowe’s gift card and save $30 instantly. ONLINE ONLY. These eBay Father’s Day gift card deals are likely to go very quickly so act quickly. Offers only good while supplies last! You’ll find instant savings on top brand gift cards plus value additions on others. 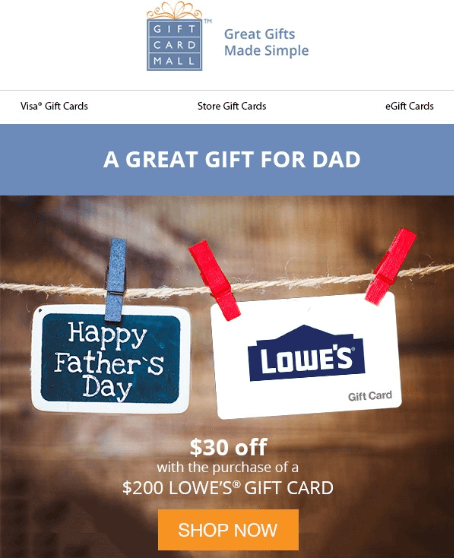 Top brand gift cards on sale for Father’s Day include: Lowe’s, Southwest Airlines, Domino’s Pizza, Gamestop, Express, JCPenney, Jiffy Lube, Brown Shoe, Applebee’s, Wayfair, Guitar Center, BJ’s Restaurant, Lowe’s and Chipotle. Gift cards at Rue21 – ONLINE ONLY. For every $50 worth of Rue21 gift cards and Rue21 eGift Cards purchased, get $10 Off! Offer valid from 06/01/2018 to 06/17/2018. Bank of America Hawk Mall Promotions – ONLINE ONLY. For every $50 worth of egift cards purchased from select brands, get additional savings as follows: Buy $50 GameStop egift card and get an additional $5 value, Buy $50 JCPenney egift card and save 10%, Buy $50 Whole Foods egift card and save 10% or Buy $50 Regal egift cards and get an additional $5. Check stores for exact details. Spring has sprung and the gift card deals are starting to spring into action too! With Mother’s Day, Father’s Day, Graduation and Wedding season moving into scope, I am seeing an increase in ways to save money on gift cards. Please also check out my list of Gift Card BOGO’s for individual merchants. There you will find gift cards offers from individual merchants…whereas this list primarily consists of ways to save money buying top brands from third-party gift card sellers. Just remember, these deals are often only good while supplies last and the gift cards more quickly! Simon Malls – IN STORES ONLY. Get a $10 bonus Visa Simon Giftcard® when you buy a Gap or Lane Bryant Gift Card OR save $10 instantly when you buy an Express Gift Card. Offers valid only on purchases made at Simon Guest Services May 7–20, while supplies last. Kroger Gift Card Promotions – ONLINE ONLY. Save $5 off $25 Peet’s Coffee eGift Cards. While supplies last. Kroger Gift Card Promotions – ONLINE ONLY. For every $50 worth of AMC eGift Cards purchased, get $5 Off! While supplies last. Garden Fresh Gift Cards – ONLINE ONLY. Mother’s Day promotion on Garden Fresh gift cards! Buy a $50 Garden Fresh gift card and receive a $10 Garden Fresh Bonus Card. Simon Malls – IN STORES ONLY. 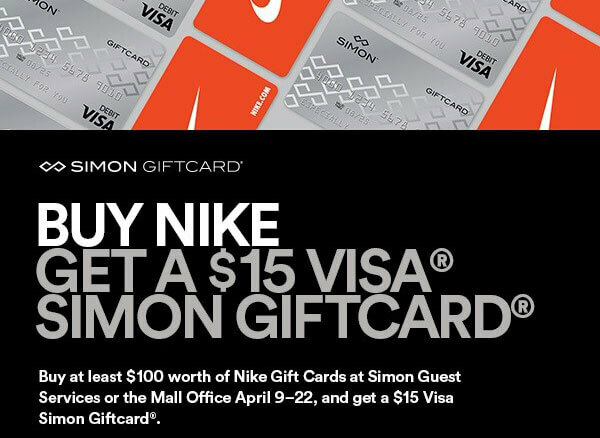 Buy at least $100 worth of Nike Gift Cards at Simon Guest Services April 9–22, and get a $15 Visa Simon Giftcard.® Limit one offer per customer. Free Cards cannot be redeemed as payment for qualifying Gift Card purchase transaction. Offer valid 4/9/18–4/22/18 only on Nike Gift Cards purchased at Simon Guest Services or the Mall Office, while supplies last. See stores for details. Kroger Gift Cards – ONLINE and IN STORES. It’s the Kroger Spring 4X Fuel Points event. Buy your gift cards and save on gas — it’s that easy! See store for details. Chase Ultimate Rewards – ONLINE ONLY. Get 10% points discount on Express gift cards, JCPenney gift cards, Sephora gift cards, Children’s Place gift cards, Ebay gift cards, Bed Bath & Beyond gift cards or REI Gift Cards when you buy with your Chase Ultimate Rewards. Physical gift cards. While supplies last. Samsung Pay – MOBILE APP ONLY. Spring has Spring Sale on Gift Cards! Get instant savings on Bow Tie Cinemas gift cards, Gymboree gift cards, Rue 21 gift cards, Wayfair gift cards and Lowe’s gift cards when you purchase through your Samsung Pay app. Kroger Gift Cards – ONLINE ONLY. For every $50 worth of Chili’s eGift Cards purchased, get $7 Off! Chili’s gift card deal valid from 4/11/18 to 4/24/18. Maximum discount allowed is subject to a maximum sum of $21 per customer. Kroger Gift Cards – ONLINE ONLY. For every $50 worth of Darden Restaurants eGift Cards purchased, get $5 Off! Maximum discount allowed is subject to a maximum sum of $15 per customer. Darden Restaurants gift cards are redeemable at Olive Garden, LongHorn Steakhouse, Cheddar’s Scratch Kitchen, Yard House, Seasons 52 and Bahama Breeze. Offer valid 4/11/18 to 4/17/18. February 2018 Gift Card Deals! In addition to those great Gift Card BOGO’s the go crazy over the holidays, we should see an increase in digital deals available this time of year. As merchants increasingly see an opportunity to bring gift card shoppers into their stores, we should see greater opportunities to save. I like this! So check out the deals I’ve found in February so far. February is the month for lovers and I love saving! Chase Ultimate Rewards – ONLINE ONLY. Get 10% points discount on Bass Pro Shops gift cards, Jiffy Lube gift cards, REI gift cards, Spafinder gift cards and J. Crew gift cards when you buy with your Chase Ultimate Rewards. Physical gift cards. While supplies last. PayPal Digital Gift Cards on eBay – ONLINE ONLY. Winter Wonderland made easier with instant savings on these top brand gift cards. While supplies last. Steak ‘n Shake – SPECIAL OFFER: For every $25 worth of Steak ‘n Shake eGift Cards purchased, get $5 Off! Offer valid from 02/21/2018 to 02/27/2018. Maximum discount allowed is subject to a maximum sum of $15 per customer. See store for details. PayPal Digital Gift Cards on eBay – ONLINE ONLY. Celebrate Loved Ones with savings on top brand gift cards. While supplies last. Amazon Discount Gift Cards – ONLINE ONLY. Amazon is offering instant savings on 14 top brand gift cards. Buy $50 gift cards and get $10 instant savings. While supplies last! Spafinders – 10% rewards on Spafinder gift cards valid on 2/2/18 only. Here’s Gift Card Girlfriend’s Complete Guide to Buying and Selling Discount Gift Cards. December 2017 Gift Card Deals! I’ve been so focused on Gift Card BOGO’s this holiday season that I haven’t seen as many gift cards on sale through my traditional channels. That changes TODAY! Below is a great deal on top brand gift cards. Stay tuned for other discounts. 4X Fueld Points at Kroger Stores – MUST HAVE COUPON. This is a great way to finish up your holiday shopping AND save money on gas! Offer limited to stock on hand. Restrictions apply. See store for details. PayPal Digital Gift Cards on eBay – ONLINE ONLY. Last Chance savings on egift cards from Spafinder and Buca Di Beppo. While supplies last. Buy a $50 Jiffy Lube Gift Card for just $40. Limit 3 per customer. 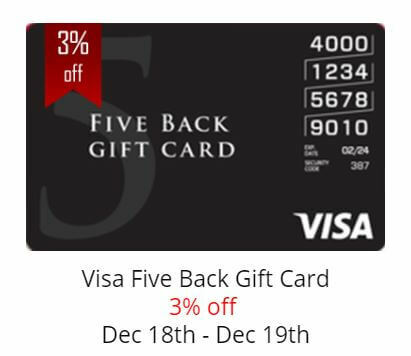 Get 3% off of your Five Back Visa gift cards from Gift Card Mall. 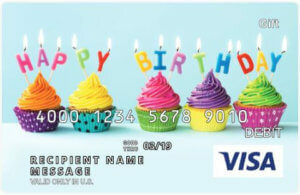 Use your Five Back Visa gift card anywhere in the U.S. Visa debit cards are accepted, including online. Shop at participating restaurants, theaters, fashion retailers and more to get up to 5% of your purchase added back to your card. While supplies last. 12/18 to 12/19. 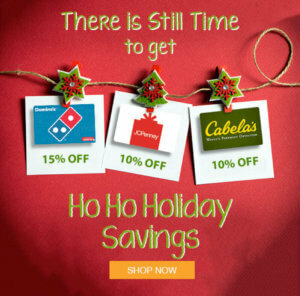 Get 10% off on Cabela’s and JCPenney gift cards. Get 15% off on Domino’s gift cards. ONLINE ONLY. Digital delivery. While supplies last. 11/13 to 11/19. November 2017 Gift Card Deals! Hold on to your Santa hats folks, because the gift card deals are about to get lit up! With Black Friday Sales making headlines and top stores and restaurants getting antsy for your gift card spending, I expect to making several updates to this blog post. Just remember, often times these deals are only good while supplies last. So get in, get your gift cards and get to saving! Staples Discount Gift Cards – ONLINE ONLY. Save $5 on $50 Petco eGift Cards. Digital delivery. While supplies last. 11/13 to 11/19. Staples Discount Gift Cards – ONLINE ONLY. Save $10 on $50 Panera eGift Cards. Digital delivery. While supplies last. 11/13 to 11/19. Staples Discount Gift Cards – ONLINE ONLY. Hurry! Discount iTunes gift cards go fast! Save 15% on Physical iTunes $50 and $100 Gift Cards. While supplies last. 11/13 to 11/19. October 2017 Gift Card Deals! Are your store shelves starting to fill with pumpkin spice, autumn candles and Halloween decorations? Then it must be time to SAVE on all of your favorite fall festivities. Here is the list of discount gift cards I have found so far. Remember to buy them when you see them, these gift card deals are only good while supplies last. Spafinder – ONLINE ONLY. 10% Off plus eGift Card on orders $50 or more. PROMO CODE: Boss2017. Kroger Gift Cards – ONLINE ONLY. For every $60 worth of Domino’s eGift Cards purchased, get $10 Off! Maximum discount allowed is subject to a maximum sum of $30 per customer. Staples Discount Gift Cards – ONLINE ONLY. Hurry! Discount iTunes gift cards go fast! Save 15% on Physical iTunes $50 and $100 Gift Cards. While supplies last. 10/9 to 10/15. Samsung Pay – MOBILE APP ONLY. Use Gap Credit card in Samsung Pay once and receive a $10 Gap Options Gift card. Use it 2 more times and receive another Gap Options Gift Card. Samsung Pay – MOBILE APP ONLY. Instant Savings! Pay only $40 for a $50 Cabela’s Gift Card (20% Savings!). Pay just $40 for a $50 Domino’s Gift Card (20% Savings!). Must purchase through the Samsung Pay mobile app. While supplies last. Amazon’s 31 DAYS OF DEALS – MULTIPLE Gift Cards – 10/1 to 10/31Amazon – ONLINE ONLY. Instant Savings on 26 different brands of gift cards including top restaurants, your favorite apparel stores, sharing economy commuting and more! While supplies last. Chase Ultimate Rewards – ONLINE ONLY. Get 10% points discount on Bed Bath & Beyond Gift Cards and 10% off on Petsmart gift cards when you buy with your Chase Ultimate Rewards. Physical gift cards. While supplies last. PayPal Digital Gift Cards on eBay – ONLINE ONLY. This is f’s, “Stock up for the Holidays” gift card sale! Instant Savings! Get DOUBLE-DIGIT Instant Savings on egift cards: Jiffy Lube, Overstock.com, Sephora, International House of Pancakes, Applebee’s, Under Armour and Sears. While supplies last. PayPal Digital Gift Cards on eBay – ONLINE ONLY. Stock up on clothes and shoes with eBay. Instant Savings! Spend $40 to get $50 in load value on Express and Brown Shoe Services gift cards. While supplies last. Need help deciding if you should redeem those points? Here is when I think it is a good idea to redeem reward points for gift cards. September 2017 Gift Card Deals! Are you ready for some football and savings and gift card deals? Perfect. You have landed in the right place. Check out the gift card sales I found for you this month. And remember to check back often because I add new discount gift cards whenever I find them. Act quickly though, because these gift card deals are only good while supplies last. Looking for a deal on gift cards? Below you’ll find information on upcoming gift card sales, discounts, “buy one get one free” offers and more. If there’s a way to save money with gift cards, then sign me up! Updated Weekly! Follow #GiftCardDeals on social media and bookmark this post because I will update it regularly with the best gift card deals in town–and online. While Supplies Last. Most deals will be available while supplies last. So if you click on a deal and don’t find the savings, then inventory may already be gone. Check For Restrictions. Lastly, be sure to check for any restrictions such as where the card can be used and how it will be delivered so there are no surprises after you buy. If you find other gift card promotions, let me know about them in the comments below or at @GCGirlfriend on Twitter. Or post them on Twitter using the #GiftCardDeals hashtag so we can all find out about these great gift card savings together.